Edited by: Albert Wirz †, Andreas Eckert, Katrin Bromber. With contributions by: Jürgen Becher, Katrin Bromber, Andreas Eckert, Michael Pesek, Albert Wirz †. 4 pp. Roman, 261 pp. The majority of papers collected in this volume originated in the context of the special research program Transformations of European Expansion from the 15th to 20th century. Studies on the cognitive interaction between European and non-European societies, supported by the German Research Foundation (DFG). The authors argue that to blame the apparent crisis of power of central governments throughout much of Africa on the effects of progressing globalization, as is commonly attributed, is misguiding. They can perceive no apparent end to the existence of territoral bureaucratic states, but rather the beginnings of a change in the societies away from the left-overs of conventional colonial and post-colonial power structures. 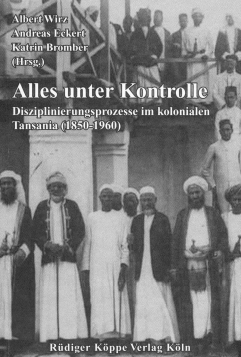 The authors follow some specific examples drawn from the colonial history of Tanzania, where the interaction between the endeavours of the colonial administration to discipline its subjects, and the reactions and evasive strategies employed by said colonial subjects sheds new light on the present situation. It becomes clear that the absorption of African societies into the colonial power structure was never unilateral but instead a complex mixture of very different forces. It also offers an explanation why, even at the end of colonial rule in Tanzania, the declared aim of a rationally ordered, bureaucratic government mirroring conditions in Europe was far from achieved. One of the main reasons for the brittleness of this colonial aspiration and its unreality can be found in the everyday actions of representatives of the colonial administration, which were often more guided by violence and lack of discipline than by the tenets preached to the colonial subjects. A central role in the said disciplinary processes were played by notions of time, space and the body held by administrators and subjects, which were given special attention within the scope of education and the military. Here the procurement of a body of loyal administrative assistants was attempted, without whom the enforcement and working of colonial power was impossible. Yet it remains questionable if these assistants really were touched by their new behavioural norms or aquired knowledge and spread them in their function as cultural brokers. Other elements of their everyday life, be they the norms of local tradition or the experience of European arbitrariness and lack of discipline, often proved the stronger influence. And from this indigenous administrative elite sprung the bearers of anti-colonial nationalism and the early independent national state, who reflected in their own use of power only too often the negative patterns of behaviour described above. Insgesamt ist der Sammelband sehr gelungen: Es besticht durch saubere, detailreiche Quellenarbeit. Die Erkenntnisse, die die Autoren daraus gewinnen, sind stets nachvollziehbar und manchmal überraschend. Besonders ist das Streben der AutorInnen hervorzuheben, aus bruchstückhaften Quellen ein dichtes und plausibles Bild des kolonialen Alltags Normalsterblicher zu zeichnen und sich nicht in der Beschreibung des Handelns von Eliten auf der Grundlage von Herrschaftsdiskursen zu erschöpfen. Dies gelingt besonders durch die Beschreibung von Einzelschicksalen und einzelnen exemplarischen Episoden. Afrikaner werden darüber hinaus als Handelnde beschrieben, die ihr Schicksal trotz aller Widerwärtigkeiten in die Hand zu nehmen versuchten und nicht als passive Opfer eines übermächtigen Kolonialregimes. Hier zeigt sich allerdings auch die Gefahr des Arbeitens mit Einzelbeispielen: Keinesfalls sollte vom Einzelnen auf alle geschlossen werden. So gab es Menschen, die räumlich vom Arm des Kolonialregimes zu weit entfernt waren und höchstens indirekt berührt wurden, andere Menschen, denen es nicht gelang, sich dem kolonialen Druck zu widersetzen, und schließlich eine relativ kleine Gruppe von Menschen, die die Grenzen zwischen den Kontrollierten und den Kontrollierenden, zumindest teilweise, verwischen und aufheben konnten.